Apostolic Titbits: Be Available To God In All Seasons Of Life!! Be Available To God In All Seasons Of Life!! The words that came from his mouth caused my heart that had long been dead, TO LEAP TO LIFE as he exclaimed with a cherub-like voice, 'Ma'am, I just came to tell you that JESUS REALLY DOES LOVE YOU .' Then he gave me this Gospel Tract that I now hold in my hand. Probably no church has had a more glorious moment, and probably this universe has never seen a Papa that was more filled with love & honour for his son.... Except for One. What lesson can we learn from the above story? 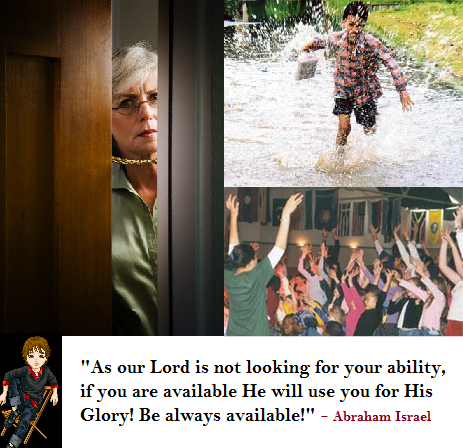 God sees not our ability but rather our availability to be used by Him at all season and all times. If we are willing and available to God, he will use us like He used this little boy of the Pastor to bless and save the needy old woman. Age is not a factor that restrains God from using for His Glory, in fact when the Pharisees and Scribes restrained themselves and others from praising God through Jesus when He did wonderful things, God used the children to praise him as the promised Messiah and bring glory to Himself through Jesus (Matt 21:15). When these evil hearted Chief Priests and scribes became indignant hearing that and asked Jesus, " “Do You hear what these are saying?” And Jesus said to them, “Yes. Have you never read,‘Out of the mouth of babes and nursing infants you have perfected praise’?” (Matt 21:16). In other words, God says that He is ready to use even children in the work of God if they are readily available to do His work and bring glory to Him. What a lesson! May we all be ready with the word of God filled in our heart in season and out of season, so that we can preach it and convince, rebuke, exhort, with all longsuffering and teaching so that souls might be saved for eternity for the Glory of God (2 Tim 4:2; 1 Tim 4:16). You might be the next person to touch someone in need and save them for eternity ahead if you inculcate the heart and passion of this little Pastor's son who reached a precious dying soul with the good news of Jesus in the midst of all his external difficulties that he faced on that particular day. Kudos to the little boy! Be ready as a general of JESUS' army in these end times to wisely save souls and thus fill heaven and empty hell! Praise the Lord!! !